The iGuard capabilities can be enhanced by the use of this IG-ER01 Remote Door Relay, which is sold separately from the iGuard units. The Remote Relay assures that malicious damage to or tampering with the iGuard does not result in a release of the electric door strike or magnetic lock by removing the door strike capability from the iGuard itself to a relay on the secure side of the door. This device is to be physically installed inside the premises, and it is connected to the iGuard's Remote Relay connector at the back of the unit through a special twisted-pair cable. When using the relay, the electric door strike actions are controlled by the remote door relay rather than directly by the iGuard unit. The remote relay will only release the strike / lock when a properly addressed Release-and-Relock signal is received from the iGuard unit to which it is attached. 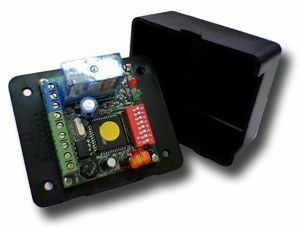 This unit is powered by the iGuard unit itself and must be configured specifically for each iGuard using the included DIP switches with 256 different combinations.